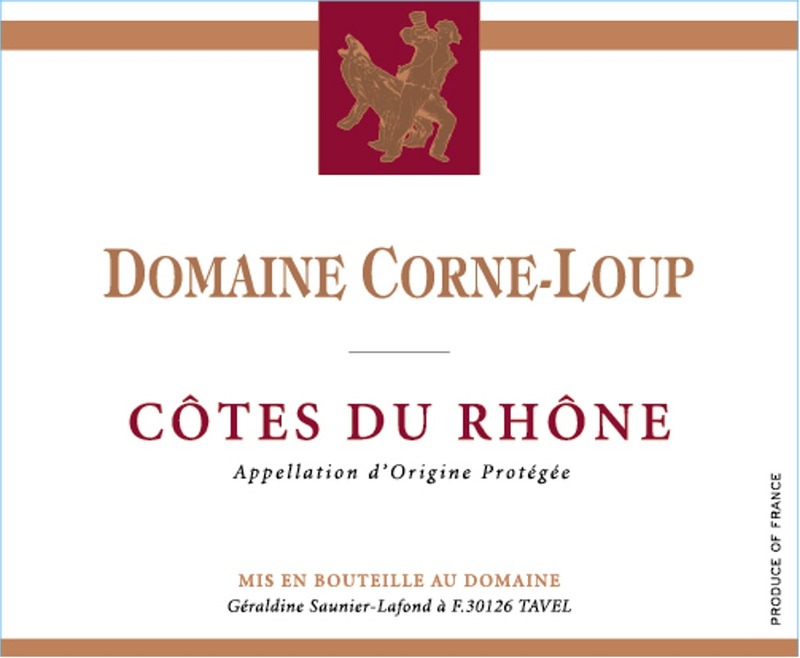 Corne Loup Cotes du Rhone Rouge is made from 50% Grenache, 40% Syrah and 10% Mourvedre. The colour is purple-tinged garnet.The aromatic range of the nose goes from fresh berries (wild raspberry, blackcurrant, blackberry) to spices.The palate is big and full-flavoured, with silky-smooth tannins and aromas of the fruit already mentioned. The finish introduces touches of liquorice and pepper. A Côtes du Rhône with great complexity for an every day drinking. A classic Rhône to drink between 1 and 4 years. "A blend of 60% Grenache, 35% Syrah, and the rest Cinsault, the 2016 Côtes du Rhône Reserve sports a deep ruby/purple color as well as a sweet nose of garrigue, pepper, and loads of red and black fruits. Medium-bodied, nicely textured, and undeniably delicious, it shows the quality of this great vintage. Drink it over the coming 4-5 years." Alcoholic fermentation in stainless steel vats at controlled temperature; aged in American oak barrels for 12 months. Red ruby colored wine with violet tones; well-balanced, black fruit, vanilla and coconut flavors. Powerful, complex and silky smooth…classic old style Rioja at a bargain price. "This red offers dried cherry, plum, licorice, cola and toasty notes, rich yet balanced, mingling over firm, well-integrated tannins. Balsamic acidity keeps this lively. Drink now through . 8,500 cases made. –TM"
"Vivid ruby. Deeply pitched scents of candied dark berries, cherry-vanilla and woodsmoke, with a suave floral note building in the glass. Supple, sweet and expansive, offering broad blackberry and violet pastille flavors and a late touch of coconut. Fine-grained tannins come in late on a long, spice-tinged finish that echoes the vanilla and smoke notes. This wine was raised entirely in American oak. - Josh Raynolds"